There has been lots of controversy around what resolution The Order will run at on the PS4. We are here today to set all of that in place and put the facts in order. Yes the game has been confirmed by many news outlets that the game will run in 1080p, but many people are still confused on how, when the game has also been confirmed to run at a a display ratio of 1920x800. There are two explanations to explain why The Order is 1080p, versus 800p and I will use two examples to explain why. A simplistic example and a more in-depth explanation using facts about resolution and aspect ratios themselves. I will also use Forza 5 and Ryse as examples to help carry the points across. Ryse runs at a resolution of 1600x900 (which maintains an HDTV's aspect ratio of 1.78:1 - or 16:9). 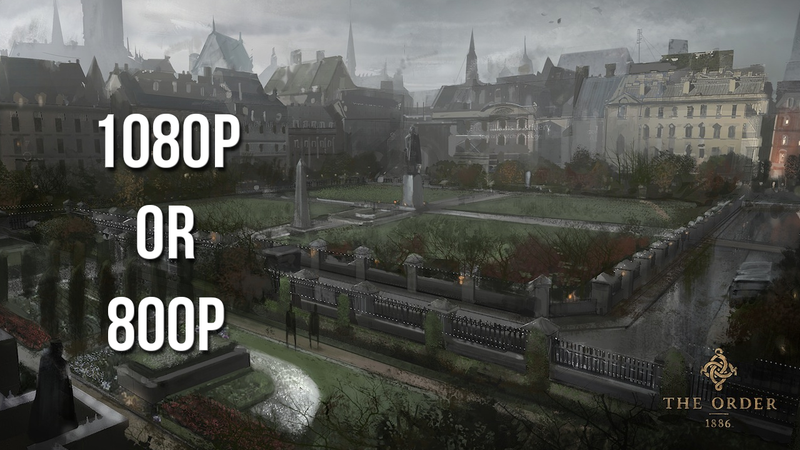 The Order: 1886 will be presented at 1920x800 (which is the CINEMATIC aspect ratio of 2.40:1). At this aspect ratio, you would need a screen resolution of 2592x1080 to avoid the black bars. The game renders an image of 1920x1080, just 280 horizontal lines are black. For comparisons sake, lets use Forza 5, a full 1080p game. Now if were to tape two black rectangles at the top and botton of our TV screens, you would now be seeing Forza 5 in 1920x800. The picture left displayed is still a 1080p image, the only difference is now only 800 horizontal lines of pixels are visible. Resolution is measured in pixel density, and The Order may have a display ratio of 1920x800, but keeps the same pixel density as a 1920x1080 resolution. Furthermore, what The Order is doing, isn't much different than most Blu-Ray movies. When you watch a 1080p movie, nine out of ten times the movie is in widescreen. Which is the cinematic aspect ratio we talked about before. 2.40:1. The Order will be displaying the same as any 1080p widescreen Blu-Ray movie would. It has also been stated by the developers, and more importantly the founder of ReadyAtDawn, that The Order was chosen to run this way to include 4xMSAA. Also quoted by Andrea Pessino, "4xMSAA which looks spectacular! x800 with AA looks MUCH better than x1080 without" and "x800 with 4xMSAA needs more bandwidth than x1080 would, so 1080 no MS would be cheaper." Also note Andrea confirmed that the game will run at a frame rate of 30fps.